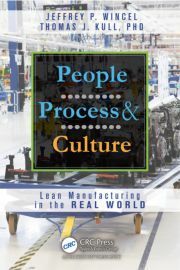 People, Process, & Culture: Lean Manufacturing in the Real World illustrates the impact of culture on the implementation of Lean Manufacturing (LM) across various geographic and cultural areas. BOCA RATON, Fla. - April 1, 2013 - PRLog -- Examining Lean processes in the context of the authors’ academic research in-progress, People, Process, & Culture: Lean Manufacturing in the Real World illustrates the impact of culture on the implementation of Lean Manufacturing (LM) across various geographic and cultural areas. It identifies cultural values, as examined against Lean manufacturing disciplines, and derives culturally based Lean Manufacturing (LM) values. It then assesses these cultural values in light of specific LM components, such as PULL systems and TPM, to demonstrate varying perspectives and applications. Building on the continued prominence of LM as the preferred operational approach, the book supplies time-tested advice to help you sort through the flood of information on Lean techniques and culture. It examines the numerous Lean components currently being deployed successfully around the world and identifies the limitations that can result from the varying interpretations and applications of Lean systems. Lean culture is all about Lean vision, mission, and values. This book not only identifies the Lean values required, but also supplies the understanding to integrate these values across all levels of your organization. The book will be especially helpful to international corporate managers working to demystify the sometimes hard-to-understand characteristics of Lean transformation. "... rather than learn the hard way, this book can serve as a trainer-coach, helping you and your organization make the Lean transformation by exposing where your values, or thinking, may also have some gaps. ... provides clear objective data, going beyond what has been said qualitatively and instead giving quantitative evidence. ... This is a pioneering book. It will help Lean champions pinpoint where specifically their team, their leadership, and their organizations may struggle with the Lean mindset." Jeffrey P. Wincel is founder and president of LSC Consulting Group - an independent professional consulting service specializing in Lean supply chain management. Mr. Wincel was also an adjunct professor of supply chain management for Grand Valley State University’s MBA and undergraduate programs. In 2004, Mr. Wincel released his first book through Productivity Press, titled Lean Supply Chain Management: A Handbook for Strategic Procurement. Previously Mr. Wincel served as VP & General Manager and Vice President of Corporate Procurement & Materials for Donnelly Corporation. Prior to Donnelly Corporation, Mr. Wincel served as Director of Worldwide Purchasing for TRW-Vehicle Safety Systems, Inc (VSSI) & Director of Worldwide Purchasing for TRW Occupant Restraints System Group (ORSG). Mr. Wincel has a Master’s of Business Administration (MBA) from Michigan State University; has been selected as one "Pros to Know" by Supply & Demand Chain Executive Magazine in 2002, 2004, 2007, & 2012. He is a frequent contributor to many professional & industry publications, including Supply Chain Management Review and Purchasing Magazine. Mr. Wincel has also been a featured presenter at the University of Michigan Conference on Lean Manufacturing, the National Manufacturing Week Conference, the Institute for Supply Management, and the Institute for International Research. Mr. Wincel has also been a panelist on the ISM national satellite education series. Thomas J.Kull is an assistant professor of supply chain management in the W.P. Carey School of Business at Arizona State University. Along with 13 years of industry experience in the steel processing, automotive, and construction equipment industries; he also holds a PhD in operations and sourcing management from Michigan State University. He researches behavioral issues in operations and supply chain management, as well as supply chain risk issues. He has published in the Journal of Operations Management, Journal of Supply Chain Management, Decision Sciences Journal, IEEE Transactions on Engineering Management, European Journal of Operational Research, and International Journal of Operations and Production Management. He serves on numerous editorial review boards, including Journal of Operations Management, Decision Sciences Journal, Journal of Business Logistics, and Journal of Supply Chain Management. He is a member of the Decision Sciences Institute, Academy of Management, and Production and Operations Management Society.